The founder of Viro, Junus Sumardi, began his business with two broken-down extrusion machines in the early 1980s. A self-taught plastic extrusion specialist, Junus supplied the domestic Indonesian market with candy sticks and specialty drinking straws. In the early 1990s the economic crisis in Indonesia forced him to look elsewhere for growth. An opportunity to make this growth happen came when an outdoor furniture manufacturer contacted Junus looking for an all-weather wicker fiber. This was when Junus launched a new export business and Viro was born. 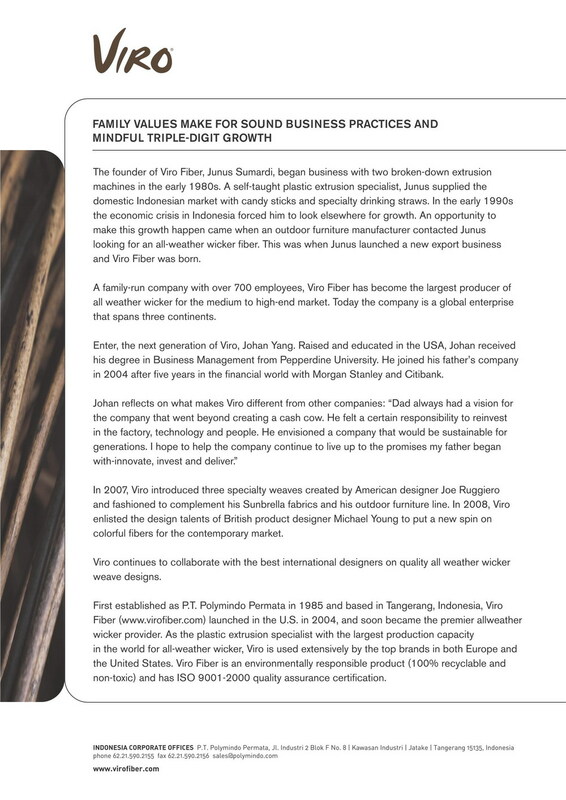 A family-run company with over 300 employees, Viro has become the largest producer of all weather wickers for the medium to high-end market. Today the company is a global enterprise that spans three continents. Enter the next generation of Viro, Johan Yang, raised and educated in the USA, Johan received his degree in Business Management from Pepperdine University. He joined his father’s company in 2004 after five years in the financial world with Morgan Stanley and Citibank. In 2007, Viro introduced three specialty weaves created by American designer Joe Ruggiero and fashioned to complement his Sunbrella fabric and his outdoor furniture line. In 2008, Viro enlisted the design talents of British product designer Michael Young to put a new spin on colorful fibers for the contemporary market. Viro continues to collaborate with the best international designers on quality all weather wicker weave designs. First established as PT Polymindo Permata in 1985 and based in Tangerang, Indonesia, Viro launched in the U.S. in 2004, and soon became the premiere all weather wicker provider. As the plastic extrusion specialist with the largest production capacity in the world for all-weather wicker, Viro is used extensively by the top brands in both Europe and the United States. Viro is an environmentally responsible product (100% recyclable and non-toxic) and has ISO 9001-2000 quality assurance certification.